New Walk Museum & Art Gallery is delighted to present an exhibition of new work by acclaimed British Taiwanese artist Chien-Wei Chang as part of the national crafts initiative the shape of things. Chien-Wei's latest work responds to the idea of the cellar across different cultures as a space in which food is preserved in jars and bottles to nurture life in times of scarcity. Chien-Wei's cellar is a space of mystery and hidden transformation. Within its bottles and storage containers Chien-Wei has placed thoughts on his day-to-day life as he pursues his creative path. The 'cellar' is used to preserve the evidence of his journey through time and to create a kind of a diary room or archive. Chien-Wei Chang is renowned for his striking re-interpretation of seemingly every day domestic objects such as ladles and bowls in materials such as silver, wood and bamboo that reflect the artist's Chinese heritage. 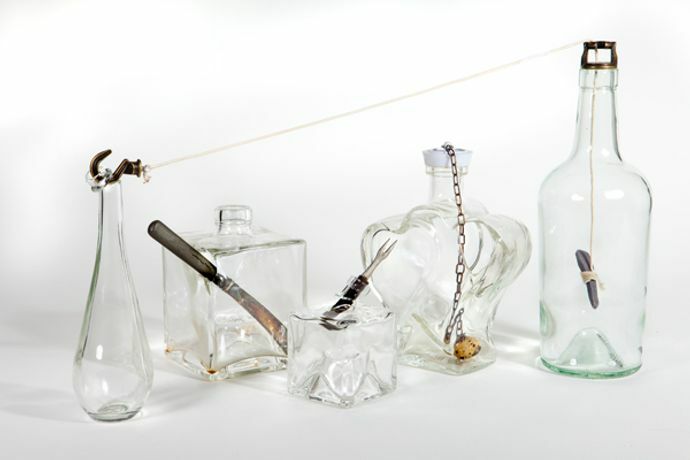 In this exhibition, he has stepped away from his main practice of silver / metalsmithing to create a major new installation work combining hundreds of recycled glass bottles alongside exquisitely crafted handmade objects.